Johnson's Dictionary is often referred to as the first English dictionary and the reason for this is not inadequate research which failed to find earlier examples of dictionary-making, but a sense that somehow Johnson's Dictionary changed the lexicographic landscape, encompassing the best of previous innovations, introducing some new practices and organising the whole entry in ways which remained standard for over a century. For these reasons Johnson's Dictionary has become an iconic text: it seems to represent both a pinnacle of achievement and a perfection in origin like Homer in poetry or Shakespeare in English drama. To some it comes as a disappointment to learn that many of the features of his Dictionary that seem so innovative and unique to Johnson's text - the illustrative quotations, the numbered multiple senses, the breadth of lexis and inclusion of common words, even some of the definitions themselves - were not actually Johnson's invention at all but were copied from some earlier text. 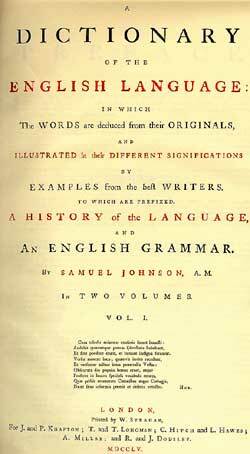 The fact remains, nonetheless, that Johnson's Dictionary was the first general monolingual dictionary to be selective about the words it included, to include vast numbers of illustrative quotations as a way of demonstrating meaning and to organise all these features of an entry in a systematic way. Johnson's Dictionary rightly embodies a sense of beginnings in lexicography because it draws together many of the previous practices into a more consistent methodology. He applies to the monolingual English dictionary practices which had previously been applied only to bilingual dictionaries, particularly Latin dictionaries, or to technical dictionaries, or to specialised dictionaries such as law dictionaries. His methodology and careful delineation of sense remained a model for subsequent lexicographers even into the twentieth century.